You will love THE GLASS WIVES, by Amy Sue Nathan for its intriguing plot twists and heartfelt story about motherhood, friendship, and family. This beautiful first novel is highly recommended for its interesting plot, compelling characters, and excellent writing. In the tradition of Marisa De Los Santos and Jennifer Weiner, author Amy Sue Nathan has penned a debut novel that will challenge readers’ preconceived ideas of what family and friendship should be, while at the same time renewing their hope in timeless traditions of love and faith. 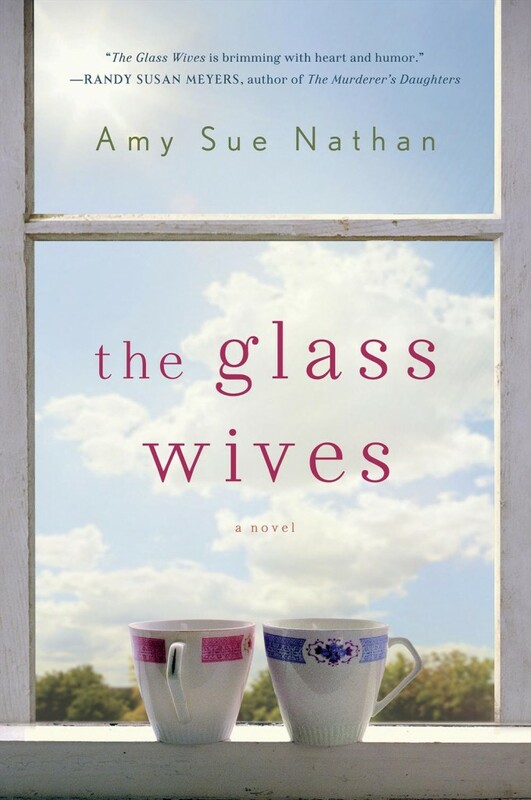 Expertly penned, The Glass Wives, by Amy Sue Nathan, creator of the incredibly popular Women’s Fiction Writers blog, is a fascinating story about how we as humans crave family connections even when, or perhaps especially when, our own family ties have been unraveled. In this case, the lives of Evie and Nicole glass have come apart through tragedy and are being woven together with each other, much to Evie’s dismay, after Evie’s ex-husband, who happens to be Nicole’s husband, dies in an accident. Sound complex? Well it is, and that’s what keeps the tension so tight in this book that readers might not be able to put it down. Sometimes comical, always heartfelt, Evie’s responses to her predicament make us laugh and cry right along with her. A single mom who just wants her children to be happy, Evie is in a rut and it is obvious from the beginning that she has left herself far behind, even before the death of her ex-husband. Holding to her Jewish traditions, family, and friendships, she thinks she’s doing it all pretty well, but that was before Nicole, her dead ex-husband’s mistress, now a widow, shows up on Evie’s doorstep with her baby. As the story progresses, the situations Evie gets caught up in with Nicole, all for the sake of her kids’ happiness, almost bring out the worst in her, especially when she discovers something about her ex-husband’s widow that might prove Nicole’s intentions aren’t all good. Above all, Evie must protect her kids, but whether that means with Nicole and their baby brother still in their lives or out of their family completely seems impossible for Evie to know. As sparks fly and complex events unfold that open old wounds for Evie challenging life-long friendships and deeply felt ideas of what is right and wrong, and more importantly threatening the happiness of her family, the author deftly reveals a deeper and more emotionally mature quality in Evie’s character than readers expect. As Evie strives to make the right choice for her children, she will no doubt inspire readers and perhaps even affirm their faith in the importance of family however seemingly fragile, and even in faith itself. I loved reading about the Jewish faith in this novel and for me, it didn’t overtake the story at all, but contributed to the depth of the story. Nathan puts real characters, real faith, and real personalities in a surprising and seemingly impossible situation that kept me turning the pages. With this fantastic debut novel, Amy Sue Nathan is an author to watch. Watch for Amy Sue Nathan’s upcoming novel, THE GOOD NEIGHBOR, releasing this month.